I read this article and found it very interesting, thought it might be something for you. The article is called Bad Loans Of State Banks = Defence + Education + Roads + Health Spends and is located at https://archive.indiaspend.com/cover-story/bad-loans-of-state-banks-defence-education-roads-health-spends-64398. 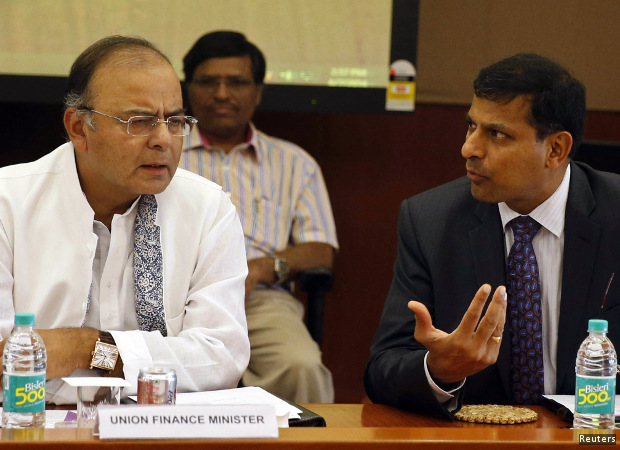 Finance Minister Arun Jaitley and Reserve Bank of India (RBI) Governor Raghuram Rajan during a financial stability development council meeting in June 2014. “No one wants to go after the rich and well-connected wrong-doer, which means they get away with even more,” Rajan wrote, in an email to RBI employees last month. Click here for bank-wise details. Source: Budget documents of ministries: Defence, Health & Family Welfare, Human Resource Development: Department of School Education and Literacy, Human Resource Development: Department of Higher Education, Road Transport and Highways. Indeed, the actual value of stressed and below-par assets of public-sector banks is higher than the NPA data reveal. There are a number of loans that have been restructured, which means the borrower gets more time to repay the loan; sometimes, the interest rate is lowered as well–because the borrower could not, or did not, keep to the original terms of repayment. The combined level of NPAs and restructured assets is 14%–or one rupee in seven–of all loans made by India’s public-sector banks, close to Rs 8 lakh crore ($117 billion). This amount, higher than the gross domestic product (GDP) of Oman, Sri Lanka and Myanmar, is potentially at risk. The problem has become big enough for Finance Minister Arun Jaitley to weigh in, saying there is no need to panic, a message he first issued in August 2015. The Government and the Reserve Bank of India (RBI) have tried to address the problem over several quarters. The Economic Survey 2014-15, released just before last year’s budget, identified rising NPAs as a major problem and listed the RBI efforts to curb them, including tighter guidelines on reporting bad loans. Tighter reporting guidelines are partly responsible for swelling NPA levels: Loans that could have earlier not been revealed in accounting statements are now being reported as bad loans. The RBI cites three reasons for these loans which have gone bad: genuine business reasons; wrong business decision and inefficiencies; and misdemeanour. Almost 85% of all stressed assets are from the industrial sector (Refer chart below), mostly from core sectors, such as iron & steel, infrastructure, engineering, construction, textiles and shipbuilding, all affected by India’s industrial slowdown. Contrary to popular perception, not all bad loans are the result of fraud or political influence. For instance, the four examples listed above are operational companies with physical assets. They have been brought down by a combination of factors, including poor economic conditions and high levels of debt relative to their capital and profits. In some cases, projects have been stalled due to land-acquisition issues, local opposition or environmental clearance: This is especially true for the hydropower sector, where almost all projects are behind schedule. Many of the bad or stressed loans result from mis-management and, perhaps, overly optimistic business projections, such as tycoon Vijay Mallya, whose defunct Kingfisher Airlines owes banks Rs 4,000 crore. This is not to say that there haven’t been frauds. There have been high-profile defaults by borrowers, such as Winsome Diamonds, Deccan Chronicle Holdings and Surya Vinayak Industries, which borrowed several thousand crore from public-sector banks, with very little by way of physical assets and investments. India’s banking culture of allowing influential borrowers who default to get away was flagged in January by RBI governor Raghuram Rajan. There are two effects that the rising tide of bad loans has on the banking system. First, the taxpayer ends up paying. Banks take money from depositors that they lend to borrowers. If a borrower cannot repay loans, banks make up the shortfall from their own capital and profits. If a bank has bad loans, its shareholders take the hit. India’s public-sector banks are owned by the government, and, so, these bad loans are a loss to the government and the taxpayer. Second, bad loans slow economic activity. Banks lend to companies to make profits and grow their working capital. High levels of bad loans erode bank capital, reduce their ability to raise fresh capital and reduce a bank’s capacity to lend, slowing the economy. Private-sector banks also face stress over bad loans, but their problems are nowhere close to the crisis at their public-sector cousins. The total stressed assets of India’s private-sector banks were 6.7% of their outstanding loans, against 14% for public-sector lenders, according to RBI data. Private banks have consistently had lower NPA levels. For the quarter ended December 2015, many private banks, such as HDFC Bank, IndusInd Bank and Yes Bank, have NPA levels of less than 1%; the worst private performers, such as ICICI Bank and Federal Bank, do better than the best-performing public-sector banks. Description: EMEA Health per region and country 1995 till 2014 – Health expenditure per person, hospital beds, Physicians, total (% of GDP), GDP, sum of health of GDP, Hospital beds (per 1,000 people), Physicians (per 1,000 people), Population, sum beds of population calculated value on basis of beds per 1000 people. Well said. In India, it’s always easy to punish the poor and the weak. Big houses take loans and never pay. Then, they hire the big lawyers using the same money, to keep the case running for years. Until the law for everything is strict, it will stay this way. The ‘Big People’ are not afraid of any law these days. It’s only the middle- and poor-classes that suffer. Yes, Sudhir but that is what our history is about, more or less?